On Windows 7 and previous builds you start your PC and pay really close attention to the first screen that appears. Look for a notification that tells you which key or combination of keys to press to enter the BIOS settings. If you miss this notification the first time, just simply restart your computer again. Usually, the key to press is likely to be: Delete, F1, F2, F3 or Esc. If you are not sure, consult the manufacturer of your computer for the answer. When you are sure which key to press to enter your PC’s BIOS, restart your PC again. 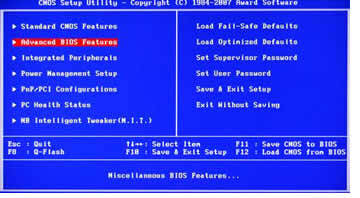 Press the key to enter the BIOS settings and you will see yourself in the BIOS within a few seconds. On Windows 10, the fast startup feature is adopted, so, you cannot press the function key to enter the BIOS configuration when booting your PC, as you get no chance to press the appropriate key. Another problem with older PC’s is they may have both PS/2 and USB keyboard connections. And the USB connection is usually set as the default. So, if you are using a USB keyboard it will not even be recognised until after the PC passes its start up commands (Power On Self Test (POST)) so you will not be able to use it to enter the appropriate key to enter the BIOS (however you could get an old PS/2 keyboard and use this to enter the key commands). Thankfully there are a couple of ways to enter the PC’s BIOS if you are using Windows 10. This method worked well for me with my USB based Microsoft keyboard (see above). 1) Press and hold the Shift key, then turn off your PC. 2) Now press and hold the function key on your Windows PC that allows you to go into BIOS settings (usually Delete, F1, F2, F3 or Esc) then turn your PC on again. DO NOT release the function key until you see the BIOS screen display. 1. Go to Settings. You can get there by clicking the gear icon on the Windows Start menu. 3. Select Recovery from the left-hand menu. 4. Under Advanced Options click Restart Now. During rebooting it will bring you to an Advance Startup Screen, once there click the Troubleshoot option. 5. Now click Advanced options. The resulting screen shows six choices. Select UEFI Firmware Settings. 6. Now click Restart. Your PC will now restart and take you straight to the BIOS. NOTE: The UEFI Firmware Settings interface which was present in earlier Windows 10 versions has been removed from the latest builds so you now get a Launch Recovery Environment instead. This makes this Option unworkable unless you have an older version of Windows 10. By the way, DO NOT make changes to your BIOS settings unless you are well aware of the possible consequences.